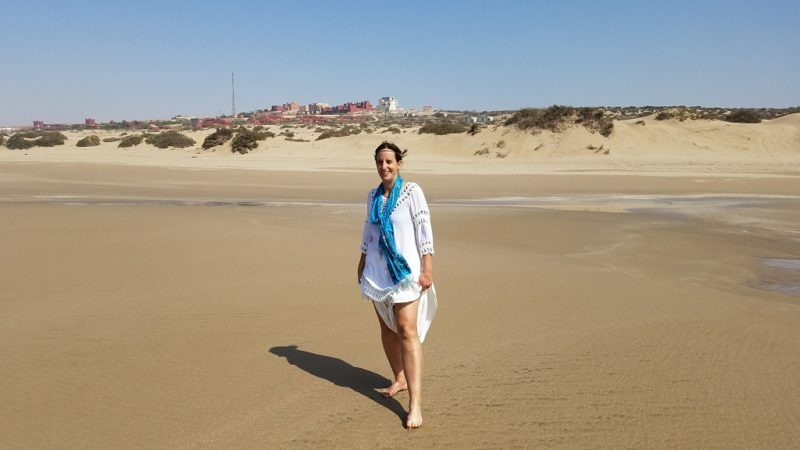 Morocco had been on my radar and had intrigued me for quite some years. The images of exotic souks, peddling everything from curries, to wool rugs, to handmade leather slippers seduced me. If those things call to you too, then your time in Morocco should include at least three or four days in Marrakesh. 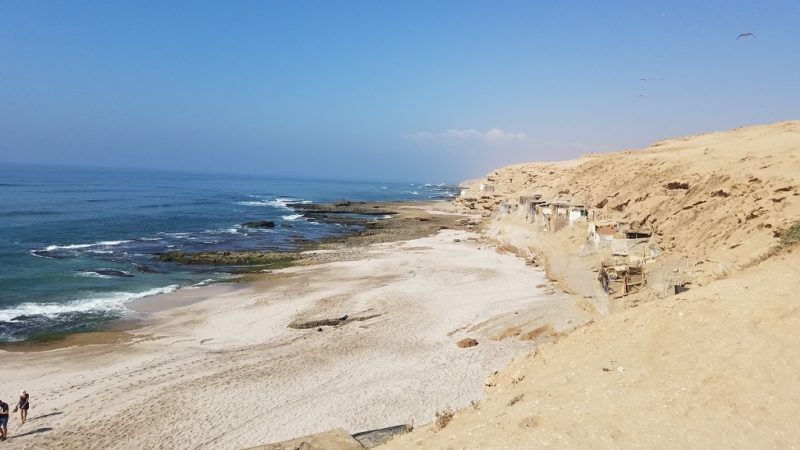 And when your thirst for overstimulation has been quenched, then it’s time to head south, for a visit to the rural Souss Valley. Because Morocco is so much more than just its cities. It is all too common that when we travel to a new country, we end up sticking with only the major cities. Most often the one we fly into. Or in Europe, take the train to. I love cities and generally don’t feel complete visiting a country unless I hit at least one major population center. Although there have been exceptions to this statement. Yet, have you considered that if all you see are the cities, you are most likely missing out on the chance to gain a deeper cultural understanding? Smaller towns have a more everyday feeling type of vibe and are often less touristed. I often feel like I have stepped into a place where I can more fully witness a slice of life. The pace of life is more relaxed, which allows me to slow down and spend more time observing and being. 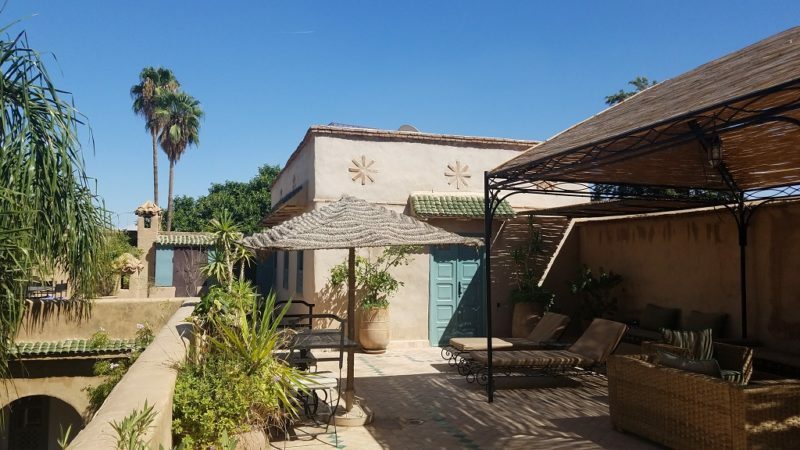 Make Taroudant your home base. I chose Taroudant as my home base in the Souss Valley. It has a population of 80,000 and was central to a couple of day trips I was interested in taking. Since I aim to not drive more than two hours each way for a day tripping, it is critical to have a good base. 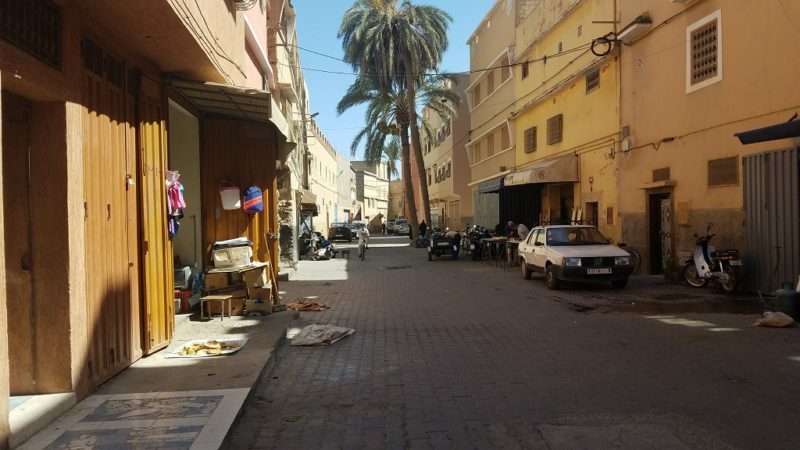 Taroudant can best be described as Marrakesh’s smaller cousin. And yes, I found there to be plenty of similarities, but taken down a few notches in terms of frenetic energy. 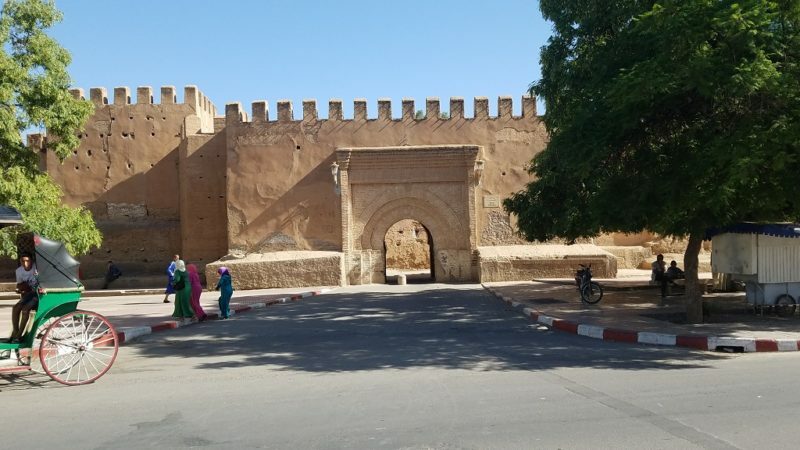 Taroudant is a walled city. Seven and a half kilometers of ramparts surround the city and horse-drawn carriage rides or your own feet are both options for exploring. Take special note of the two gates from the 1500-1600’s. They are called Bab el-Kasbah and Bab Sedra. Note that the narrow width of the ancient gates reflects the fact that centuries ago only pedestrians and small donkey carts had to enter. Tarodaunt was far less touristed than Marrakesh, although I saw tour buses cramming their way through the chaotic streets. However, over the course of five days I actually saw no other Westerners walking around town. Besides a more relaxed pace of life, a visit to the Souss Valley affords you more access to varied scenery – hello Atlas Mountains! And opportunities for more intimate connections with locals, since there is much less hustling going on. You are going to need to pull me out of here, against my will! We stayed at Le Palais Oumensour, since everything we read about it appealed to us. It was very comfortable, yet not overdone. The staff was more laid back than the riad in Marrakesh. And by this, I mean they were not wearing traditional clothing and present at every corner checking on how you were doing. But don’t get me wrong. The staff was more than accommodating and friendly at Le Palais Oumensour. The manager, Jean Baptiste was French, and he checked in daily to ensure all of our needs were fulfilled. The riad was crafted in a style with European overtones. Beige plastered walls created a calming mood. In fact, this polished lime plaster is the traditional Moroccan craft called tadelakt. Bits of color were scattered with the addition of Moroccan art, to create a fusion that worked perfectly. The resident tortoise, Mensour was so sweet. He sort of showed up when he wanted and when he did, I felt lucky to pick him up. Most riads have spas within them and Palais Oumensour was no exception. They offered massage upstairs in a special room, while I had my nails done sitting outside under the palm trees. One day I was feeling under the weather and I spent the better part of the day by the poolside in a shady corner. Not only was the pool cool and refreshing, I had it to myself for much of the day. 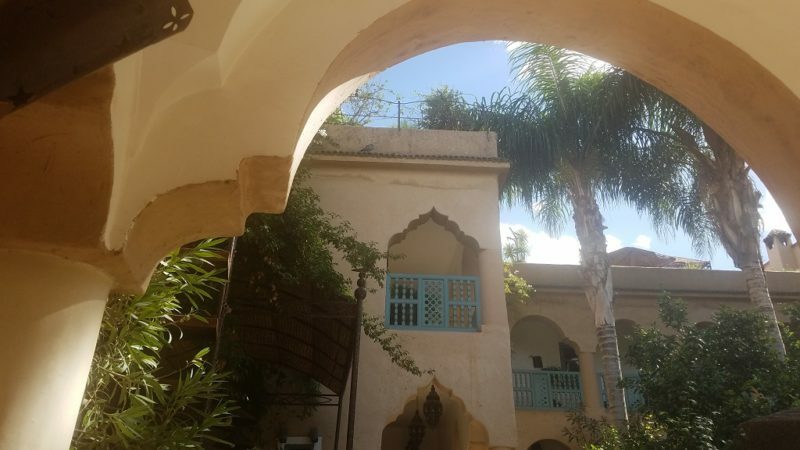 The riad had approximately a dozen rooms, so it was never crowded. The mellow mood suited us perfectly, creating a balance for the natural chaos we encountered when we entered public spaces. 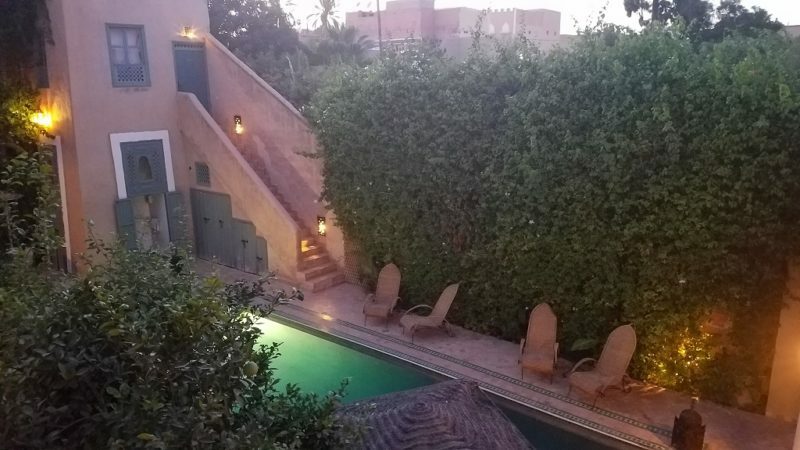 I am sure that there are likely to be other comfortable and welcoming riads in Taroudant, but based on personal experience, I can guarantee your welcome at Le Palais Oumensour. 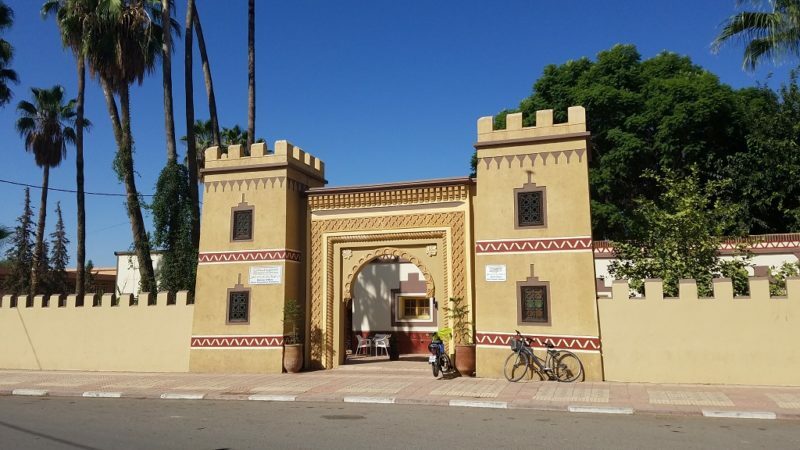 While Taroudant is not chock full of attractions, it has a few. It is best enjoyed on foot (driving is downright scary) and at a leisurely pace. I liked that we visited toward the end of an otherwise active trip. I had the opportunity to catch my breath. As with Djemaa el-Fna in Marrakesh, Assarag Square is the center of action in Taroudant. The Square was always hosting story tellers, musicians, impromptu meals, and people chatting and watching the world go by. The nice thing was that there was much less hustling than at Djemaa el-Fna so that I could actually sit back, relax, and enjoy. One afternoon I listened to a Berber story teller. Although I could not understand a word, his dynamic body language and the music he made on his “Berber guitar” had me thoroughly enthralled. By the end of his performance I swear that I had truly experienced his story. The Sunday Market is a bit north of the town center. It is worth a visit if you are in town Sunday, because, unsurprisingly, that is the only day it is open. 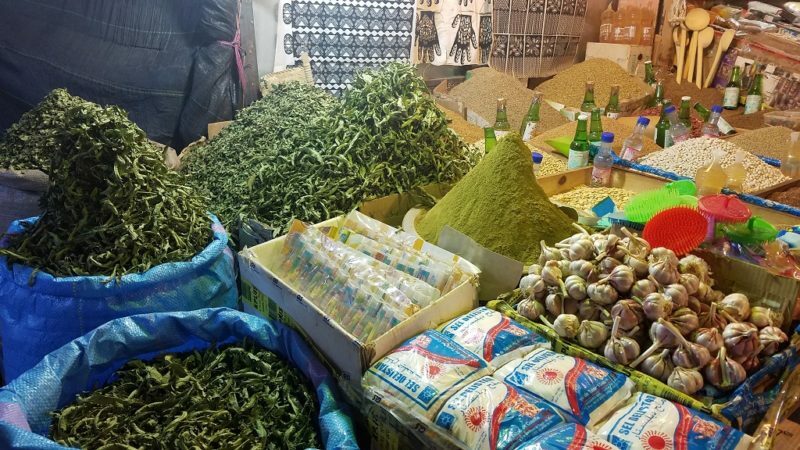 It is a very authentic, sprawling, and crazy Arab market with lots of artisanal products. You can wander to your heart’s content among live animals, mountains of vegetables, and piles and piles of second-hand clothes. The Grand Souk and the Municipal Market have a similar feel to other souks all over Morocco. Labyrinths where almost anything you can hope for is sold. They are a constant hubbub of activity. You just have to join in and be willing to let go and get lost in your searching. I found the Municipal Market, which is also called the Berber Market, to be the most charming. It is just south of Assarag and relatively untouristed. You can actually wander peacefully and enjoy the sights, smells, and sounds without being overly bothered. 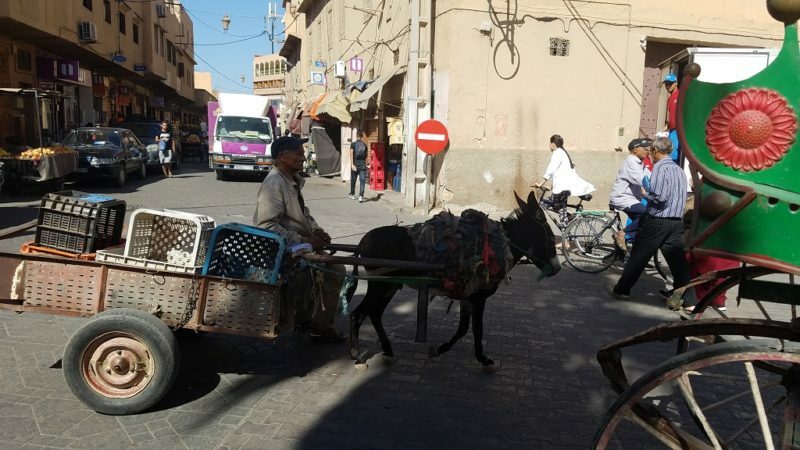 Transportation varies from bus, to taxi, to bicycle, to donkey cart! 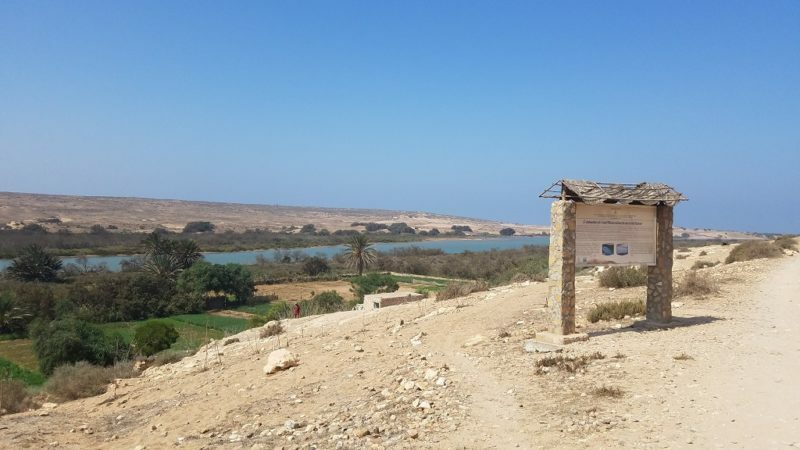 Access to rural villages and understanding the terrior of the Souss Valley. I absolutely adore plants, cooking and knowing where my food comes from. And while I admired the spice markets and endless array of body care products in Marrakesh, I wanted to get close to the source. Where exactly did all this argan oil come from? I read stories about goats jumping in trees to munch on the argan seeds. It almost sounded too cool to be true. 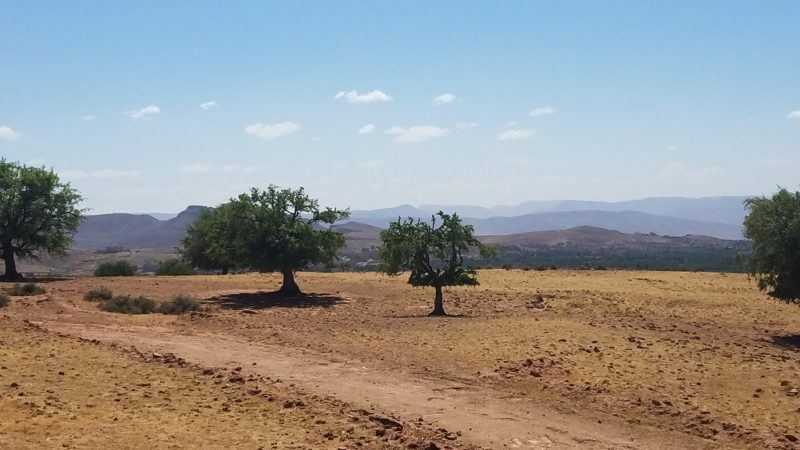 But I was willing to drive to the countryside where the argan trees grow wild to see for myself. Dan had read about Tiout, an off the beaten track village where an all-women’s argan oil cooperative was located. On our way we passed many argan trees growing on the plain. From a distance they look like olive trees. And, we learned with our own eyes that the stories we had heard were true. We passed many trees with goats up in the branches munching away. Finally, we arrived in Tiout and we pulled up at a well-kept, but fairly non-descript building. We poked around for a bit and found a door on the side where we entered. In one room, we saw two women, a mini mountain of argan seeds and a machine. One woman was scooping up the seeds in a five gallon bucket and pouring them in the machine. The other woman was near the machine, making sure things ran smoothly. The machine expelled the seed out one end and the husk out the other. We later learned that the machine took the place of the goats. The goats eat the entire fruit, process the husk and poop out the seed! Many locals gather the pooped nuts and make their own argan oil. The next room was quite fascinating, for both plant and cultural geeks. Although only 25% were occupied, there were about 30 stations for manually cracking open the seed pods. Let me mention this is the first place we went where nobody spoke any French. Everyone probably spoke Arabic and Berber. So we did our best communicating in sign language. With many smiles and gracious gestures, I was invited to sit down and take a crack at things. I took my shoes off, got comfy on the floor, pillows on my back and to sit on. There is a rock for an anvil and you use another small rock for a hammer to crack the seed pods. The seed pod needs to be placed just so, on its side with the crack face up on the anvil, and you take the hammer and smash it. It is a lot harder than it looks! I was afraid to go too hard and smash my fingers. And I thought it was with good reason as the woman next to me had every finger bandaged. If I did not hit hard enough, the seed pod did not crack. If I laid the seed pod down and banged, the pod cracks and a piece can fly off and hurt an eye (mine or neighbors). When I finally got one open the right way, there was still work to do, since there are 2 or possibly 3 nuts inside each seed pod. So, then I needed to bang in a slightly different angle to free the nuts. Once I got to the prize, the argan nuts looked like slivered almonds. I spent a while attempting to be of some use. Although I realized I would never crack enough to contribute to their stash, so it was all about my experience. At some point, grateful for the women’s hospitality, we moved on to the extraction room. We looked into a large room at machines that ground the nuts and separated them from their oil. They are a higher tech version of the mortar and pestle I used back in Marrakesh. A nourishing argan oil, revered for the health of the skin and hair, emerged from the machines. 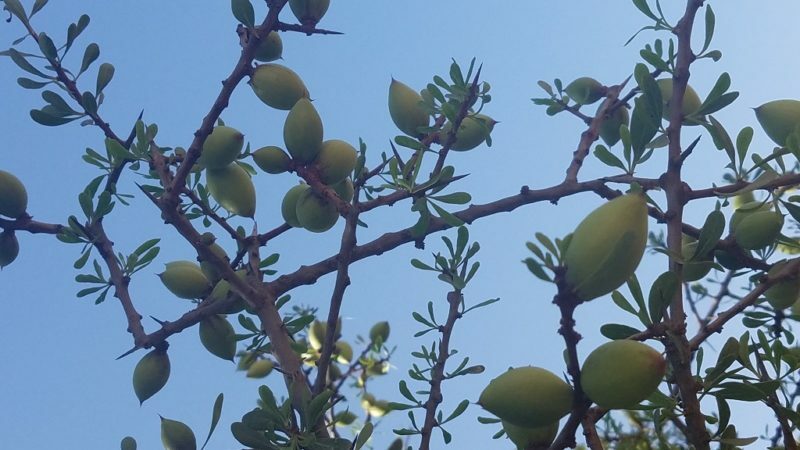 Before arriving in Tiout, argan oil was just an ingredient in my body wash. Now I had a vision and context for argan oil. Dan asked a woman who spoke very little French about a store and fortunately she knew that word and directed us to the magasin. Once we entered, we realized that it was the storefront where most visitors enter. Although we were glad we had charted our own course through the back door. We were quite grateful the shopkeeper was multi-lingual and filled us in on a lot of the details about the co-op and argan oil. And don’t worry, she assured us that the co-op does not use nuts processed by goats in their products, saying that they sometimes have a certain flavor. The co-op is quite inspiring and a wonderful institution. The work provides income and a sense of community and pride to rural Moroccan women. 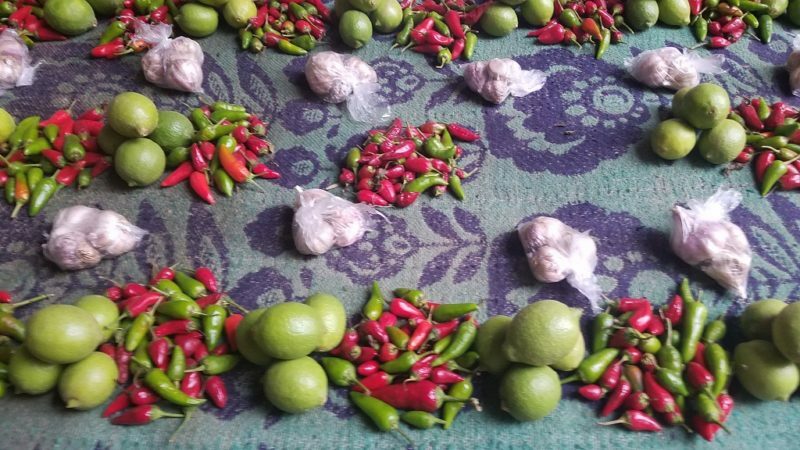 All the while leveraging a local crop. And to cap the work environment off, there is an elementary school in the same building attended by many of the children of the workers. We left hoping that no one would put the women out of work by inventing a machine to crack the argan nuts. There were lots of argan products to choose from and we each went home with several products for ourselves and gifts for friends. A saffron village! Saffron is the most expensive spice in the world. One whose flavor is so distinctive and irreplaceable in certain dishes. It comes as no surprise we were all about visiting the saffron village. The village of Taliouine is not noteworthy if you were just driving through it. Although a walk around would be interesting, even if only to check out the street food and the local taxi system with all of its different transportation options. Even simple things like those operate very differently than I am used to. 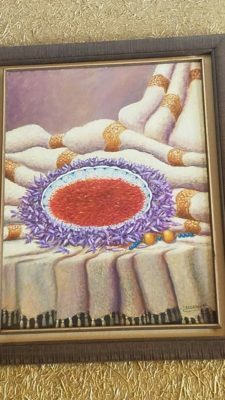 The big draw of Taliouine is that a majority of the saffron in Morocco is cultivated on the farms surrounding Taliouine. Clearly there is a micro climate that the crocuses that produce saffron have an affinity for. You should visit the Coopérative Souktana du Safran and Dar Azaafaran. The former offers a variety of saffron products. The latter offers some product, but its value to me was as a museum. 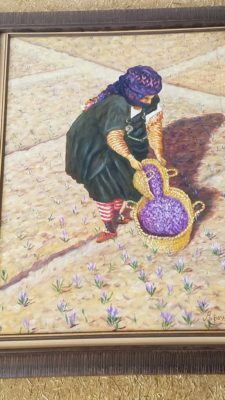 I invite you to visit and comprehend just how many flowers, land, and manual labor it takes to create a gram of dried saffron. They both represent coops, each of which have more than 100 members. As you can imagine, since farming saffron has such small yields, this is a situation where there is strength in numbers. And for the tourists, we appreciate there being a dependable source, even if it comes from a pool of farmers. Besides all that, I just always feel more connected when I spend my money close to the source. At some point, we concluded that the villages, mid-sized towns, and cities in Morocco shared a common thread. For example, the insane traffic patterns were present in small towns and you don’t get out of them until you get to the tiny villages like Tiout. Otherwise, there is less craziness, but just as insane. One thing that had me laughing all day was a sign on the side of an ordinary building and parking lot. 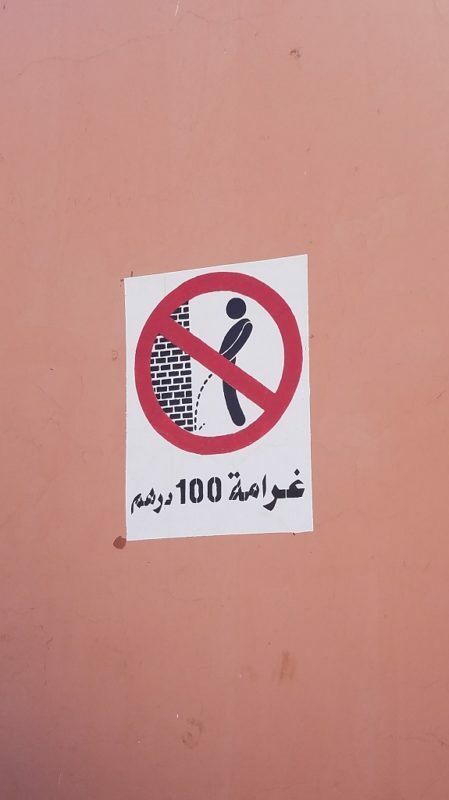 In a country where the smell of urine was ever present, I could not possibly conceive why this sign warned against urinating right here. And if you disobeyed, you would receive a fine. We passed hundreds, if not thousands, of places that would have easily justified the sign, but this is the only one we saw. When we were driving out on the open road, the expanses of space in between the villages invited us to appreciate the beauty of the countryside. Some patches we hit were lush with gardens and farms. We were probably near a water source, even if we couldn’t see it. Other stretches were flat and open, and possessed the raw beauty of the desert, in an eerie sort of way. In the distance, our eyes reigned in the sights of the mountain ranges that Morocco is famous for. The Atlas and the Anti-Atlas Mountains. In terms of broad strokes, the arid landscape peppered with juniper trees and other desert adapted plants resembled a drive through the Arizona. Even the homes were made out of the North African version of adobe. Although the earth was more red toned, which made for quite the striking eye candy when the sunlight hit just so. Access to hiking the Atlas Mountains. The Atlas Mountains extend beyond Morocco, through other parts of Northern Africa. They can be divided into sub-ranges as well. Which is why you may have heard the terms High Atlas, Middle Atlas and Anti Atlas. From the perspective of our drive through the Souss Valley, the craggily High Atlas peaks were to the north. The flatter, but still impressive Anti-Atlas were to our south. 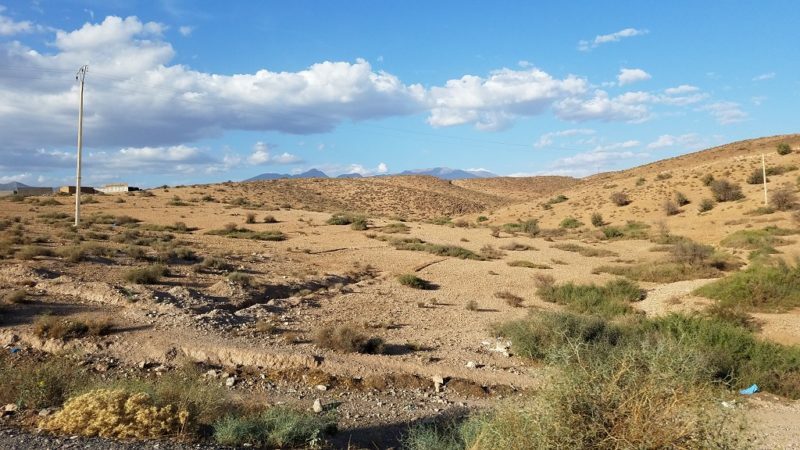 Hiking is definitely a seasonal activity in Morocco. I visited in September and the heat was still pretty intense. 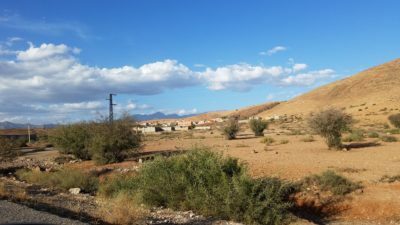 If you know you want to hike the Atlas Mountains, then plan to do so when the weather is cooler. The High Atlas Mountains are best accessed from the town of Demnate. It is a town of about 25,000. It would be the most practical base, although it is not actually in the Souss Valley. Demnate is about 90 minutes east of Marrakesh. The Middle Atlas Mountains are further north in Morocco. Ifrane is the French built town that would make the ideal base. I did not get at all close to there on my trip. However, exploring the red granite Anti-Altas Mountains pairs well when you are situated in the southern Souss Valley. 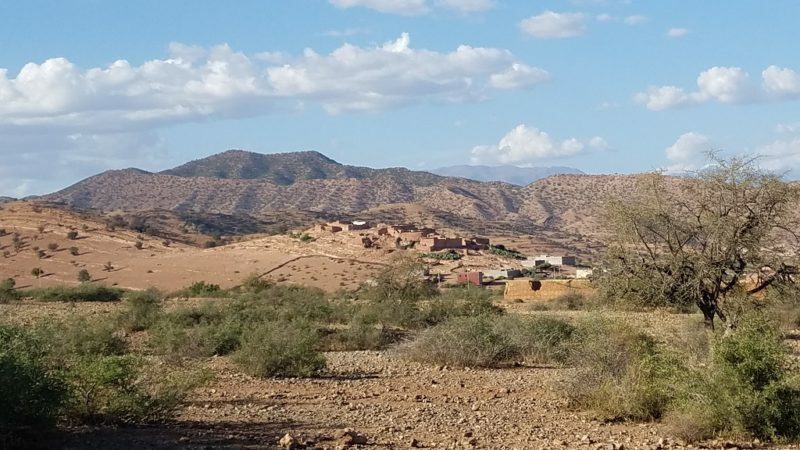 Tafraoute is a village of 5,000 people, about three hours south of Taroudant. That is where I would have stayed if I worked the Anti-Atlas Mountains into my explorations. My best guess would be that most of what you will eat in Morocco is organic. Namely because ingredients comes from small farms, ones that cannot afford pesticides. While Moroccans have refrigerators in their homes, they do utilize refrigeration in the markets. The only exception is the fish, which is stored on ice in the markets. This implies that the market vendors need to carry small quantities of produce and meat, in hopes of turning products over rapidly. The intense heat takes its tolls on fruits and veggies and the shelf life is short. At the same time, it was reassuring for me to know that I was tied into a very local economy. Furthermore, when I passed something that looked yummy on the street, I seized the moment to enjoy it. 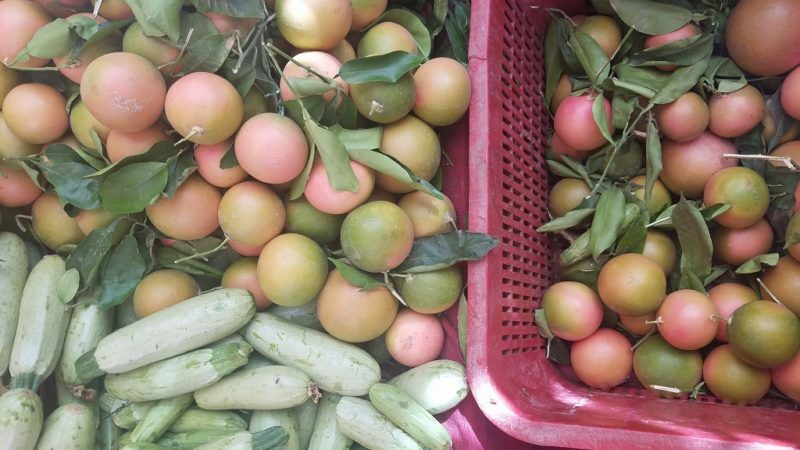 Whether it was a fresh pressing of pomegranate juice or a super ripe prickly pear fruit – I consumed it right then and there. One of the most delicious meals I had was my first evening walking around Taroudant. The smell of grilled fish wafting through the air turned my nose. 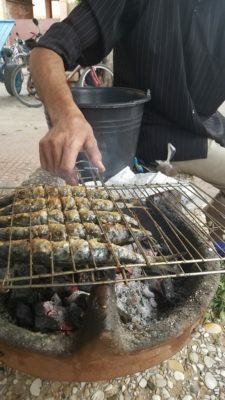 I was on the street that borders the main square, Assarag Square, where a man had set up a make shift grill. Sitting around him were a couple of handfuls of Moroccans. Mostly men but also a grandmother, mother, and young child. The chef had a plastic bag filled with sardines, his basic grill, and some salt. And that was the extent of it! I grabbed a seat and signaled at him to indicate I wanted a couple of sardines. I watched him liberally apply salt and tend to the fish over the fire. He flipped it back and forth, taking care to not overcook it, while ensuring the skin got crispy. It cost about $1 per fish. Simple, nourishing and inexpensive. It was hard to beat. And when I add in the experience of interacting with the locals, especially the mother and her endearing child, then it was definitely hard to beat. The meal I had in Taliouine was enlightening. At least in terms of my understanding how restaurants work in rural Morocco. It gives the saying “the slow food movement” an entirely new meaning. After visiting Dar Azaafaran and stocking up on saffron for 15% of what it would cost in the States, we wandered through the village. 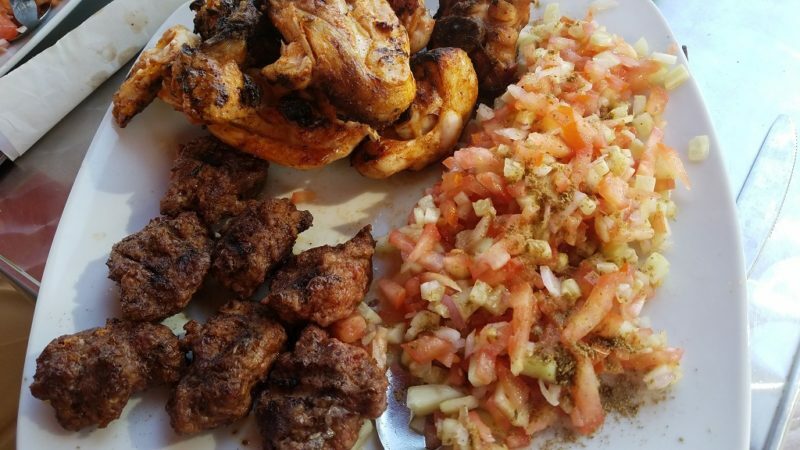 Seeing the sizzling lamb kebabs at one restaurant was enough to convince us to eat there. The cook was very friendly and sat us down. We ordered lamb and chicken and veggies. To make a long story short, we were there for about two hours, about what it have taken for a fine lunch in Paris. After he served the lamb he was grilling, he disappeared, only to return thirty minutes later with the ingredients for our meal. Presumably he made a trip to the market! Then he worked on the veggies and when he was finished, put them aside to start on the meat. The chunks of meat seemed to take forever to cook thoroughly. When it was all said and done, we had a tasty bite to eat. And more importantly, we get a sense of how Moroccans manage inventory control. And it shed some light on why things move at the pace that they do. When I say venture into Souss Massa National Park, it is because I could find very little information about it online or in guidebooks. Spending a day in a national park certainly intrigued me. Reading Trip Advisor reviews, I learned I needed a 4-wheel drive vehicle to fully explore the park. An alternative was that I might find a guide in the Massa region, which is south of the park, and explore on foot. And that is about all I knew! So, it was a bit of a risk going there for the day, not knowing if I’d find what I needed. And so we go. We arrived in the village of Sidi Binzarne and I didn’t see anything that would resemble tourist infrastructure. No signs about the park, no guides, no hardy trucks. We plug along on a bumpy, dusty road not really sure of it we have reached the park or not. In a few kilometers, we arrive at a kiosk with an old sign saying we are in the park. There are a few men sitting around and one of them states he can be our guide. He was not the high-pressure type, like in the souks in Marrakesh and we tended to believe him. Although I was very curious about what if there were other visitors to the park that day. Who would be their guide? Later he said that the other men were guides as well. We worked out a fair price and he explained that it’s three kilometers to the beach, each way. That sounded doable and very much so, because the coast was a good 10 degrees cooler than inland, in Taroudant. In fact, we could not help but relish in the cool breeze. It felt like a heavy wool sweater had been lifted from us. Hassan, our guide, was a Berber man who grew up in Sidi Binzarne, which has about 350 people. He has known about birds since he was young, because his parents knew about them. Moroccan traditions surrounding family and a tight knit community are very strong here. I am always impressed when people in such remote regions can speak five languages. Not to mention, personally embarrassed that I am not even bilingual. Bird sightings peak in the winter, but there was still plenty for him to point out. The bald ibis is the special bird of the region. And we were lucky enough to spot some of them. The temperature was rising and I’d be lying if I said it wasn’t getting uncomfortable. No trees and all. Hassan mentioned that we could eat and drink at a hotel on the beach and he could have his friend pick us up to take us back to the car. This was sounding more and more like an attractive way to go. The beach was full of unexpected yet welcome surprises! Then we spotted the hotel which turned out to be Ksar Massa, the hotel that we had read about online, while researching the park. It stood like a red castle, against the Atlantic Ocean. Very picturesque. 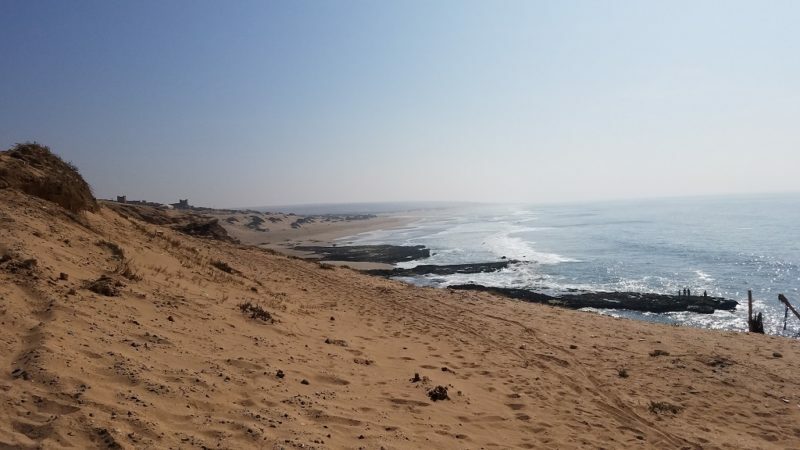 If we had known about it before we booked our trip, staying there for a couple days, off on some remote beach in rural Morocco, would have been under consideration. But that was not the extent of the paradise. We planned on eating at the hotel restaurant, not knowing other options existed. But out of the blue Jalal appeared and started talking to our guide and us. He asked if we wanted to eat in his cave. He was a fisherman and said he caught plenty of fish that morning. We quickly discarded the hotel plan and went with Jalal. His cave, which was one among many, was a sight to see. They were small homes, which consisted of one room dug into the side of the rock wall. The plaster made it so they blended into the rock and from a distance, they looked like they had always been there. The cave was akin to a Moroccan hobbit house! Hassan told us that there are hundreds of them the whole length of the national park. All the way to Agadir. Some of the fisherman live there year round, others use them seasonally and stay in the village the rest of the year. The inside of Jalal’s grotto had seats, a table, some blankets, a tangine, and a few other simple items. The Moroccan salad was alive and full of freshly squeezed lime juice. Then the platters of fish arrived. There was more than we could possibly eat, although we gave it our best shot to finish it. 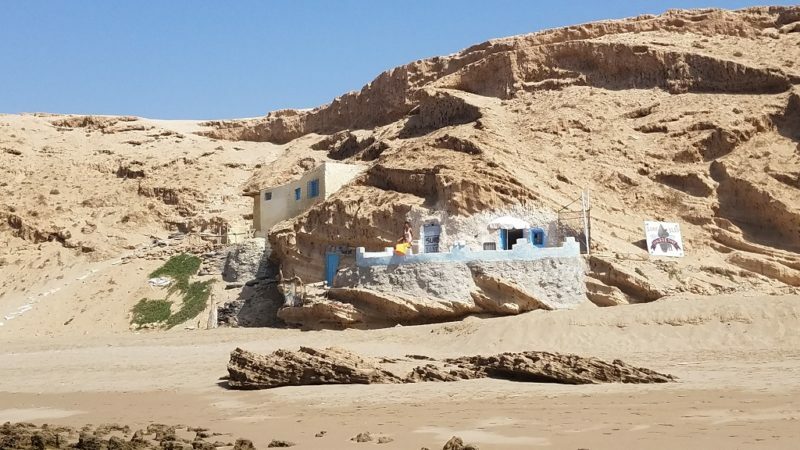 Gorging on fresh caught fish in a hand carved cave just yards from the ocean was quickly becoming one of the highlights of our time in the Souss Valley. The icing on the cake was when I went swimming in the ocean. Jalal lent me a bathing suit and off we went. I knew I would be salty and itchy for our 30 hour trip back home, but I didn’t care. I rather be itchy than regretful. Although when we emerged from the ocean Jalal had another special treat. He had gallons of sun warmed fresh water to give me a make shift shower, I knew it was meant to be. I could have this awesome of a day AND start an arduous journey home in good stead. 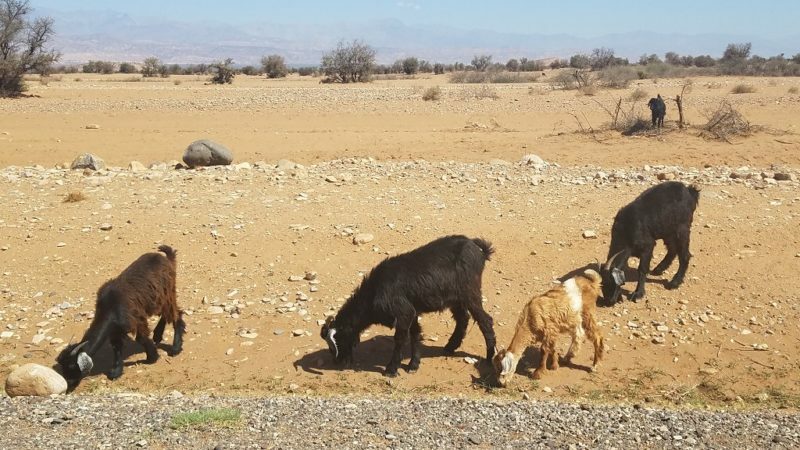 Now, that I know about the Souss Valley National Park, I would suggest staying there for two nights and utilizing the guides at the hotel. They will have 4-wheel drive trucks and can take you even deeper into the park. 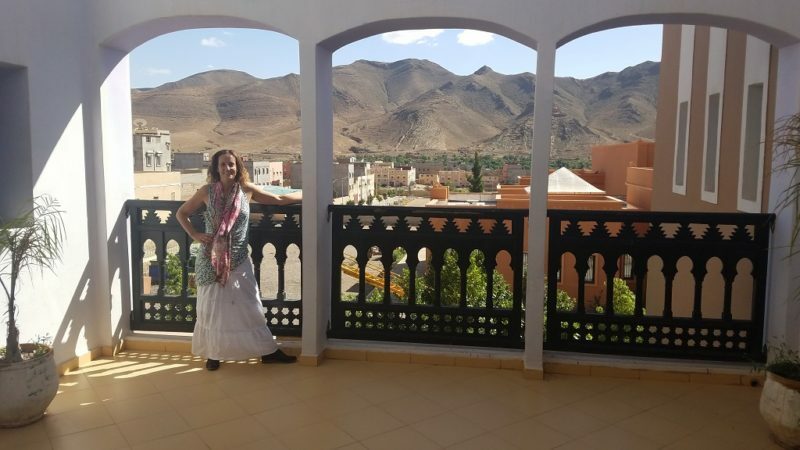 With Taroudant, argan and saffron villages, the Atlas Mountains and a national park, I hope I have given you at least six reasons to visit the Souss Valley when you travel to Morocco!